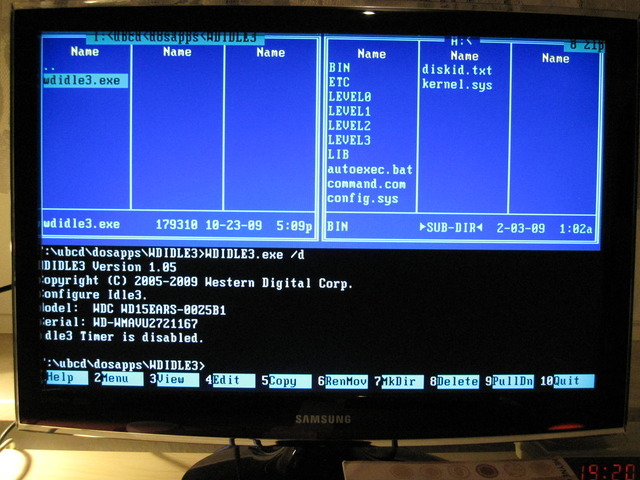 Your boot cd is still making all much simpler & better. Could have made another ebd from old XP and added wdidle3, but your approach (ubcd511custom) is way much better. Was there a wdidle3 v2.0.0.1 version given out just before the WD Red tool (wd5741). Did this wdidle3 v2.0.0.1 verion work for Blues and Greens also. Would you be able to source this and remake a new fresh 2017 iso please. That UEFI should have CSM (BIOS emulation layer) support though. Even my newer ASUS Z97 chipset has. UBCD should load with that. Otherwise I'd try idle3-tools nowadays. Thank you. This bootcd saved me a lot of work. Changed my two 5TB BLUE EZRZ to 240 secs with this bootCD and a PC ( connected outside the PC cage)and also Disconnect all other WDC drives. Anyway when i changed it to 240s and shutdown the PC i heard a ckirrrr sound for 0.1 sec from the EZRZ ??? Hmz ( i read disabled it on some drives suddenly start making noise / clikcy sounds so i set it 240 ) ??? ... lets see how the performance and counter will do. SMART shows "GOOD" inside the NAS again. is there a danger that the program will erase the discs? It will alter the drives firmware parameter, not the content of the disc itself. Since it's officially not supported by WD it could potentially render your disc unusable. Do you have any links or information/instructions on updating a WD Blue "WD10EZEX" with a newer firmware in the form of .rom and .rpm files (Windows 10)? I found the preferred firmware, wanted to know if any GUI or command line utilities exist? One of my WD greens (wd30ezrx) had 264 000 load/unload cycles, finally managed to disable the head parking feature. Thank you so much for putting all of this together. It's working with WD Purple WD20PURZ. Tried this today with a WD Grean connected to to a Dell H310 HBA. Unsurprisingly, WDIDLE3 did not find the connected device till I plugged it directly into the motherboards SATA ports. Thanks for this project! Made the process very simple!